Many people are confused and bewildered by the issue of Catalan independence. On one hand, it is a rich region with its distinct culture which was independent at some point in the past. On the other hand, it has been a part of Spain for a long period of time, basking in the benefits of this alliance. One thing is certain – Spain has not yet experienced a crisis as profound since the death of Franco in 1975. It is hard to pick one side of the issue, so, in this article I will try to shed light on both for you to decide which arguments you find more convincing for your essay. In the medieval era Catalonia was a part of the Kingdom of Aragon. In 1469, however, Aragon decided to unite with the other part of Spain – Kingdom of Castile, through a dynastic marriage. Ferdinand the Second married Isabella the First, which resulted in the Spanish unification and formation of its modern borders. For the next couple centuries Catalonia preserved its autonomy. However, it all was over in the 18th century, when during the secession crisis the region leaders supported the wrong claimant. Philip the fifth from the Bourbon dynasty decided to punish Catalonia for its near-sightedness by taking away its autonomy. In the 20 century the whole Spain suffered under Franco’s dictatorship, even more so Catalonia. Franco tried to suppress its culture and traditions, often arresting and killing its leaders. When in 1975 the dictator died, Spain decided to remain unified, although Catalonia’s struggle for independence never stopped. It was just dormant for a while, waiting for an opportune moment to erupt. There are many intricate reasons for the crisis, but I would like to touch upon only the most critical ones. First of all, it is the politics of the Spanish government. In this regard it is worth mentioning Catalonian attempt to strengthen their autonomy through a 2006 statute. Still, the Constitutional Court ruled out this bill as illegitimate. They explained that Catalonia could not be considered a nation, but a nationality, which makes it ineligible for the vast growth of autonomy proposed in the 2006 statute. It, as predicted, angered Catalonian nationalists who felt beguiled as they were denied their freedom on a technicality. So, it comes as no surprise that they decided to push for a referendum despite the Spanish government deeming it unconstitutional. They started to understand that Spain would never support Catalonian fight for independence, so they had to take the bull by the horns. Among the reasons, the economic prosperity of the region is pretty apparent. Catalonia is home for 16 % of the Spanish population, forming 19 % of the state’s GDP and 25 % of its exports. It is a very rich area which attracts much foreign investment. Moreover, it is the most visited city in the entire Spain, having millions of tourists each year. Despite its crucial role in the Spanish economy, it is estimated that in 2014 alone Catalonia paid almost 12 billion more taxes than it received from the government. Thus, many Catalonians feel resentful that their money is often used to support poorer regions of Spain. First of all, it failed because of the efficient refaction of the Spanish government. It did not only do its best to preclude the referendum on the first day of October from happening, but also adopted a hard line in dealing with separatists who were not given any role in negotiations. Many criticize the Spanish PM Mariano Rajoy for being too harsh, comparing his actions to that of a dictator. However, even though it may have been more diplomatic to agree to a dialogue, Rajoy acted in accordance with the Spanish Constitution of 1978 which specifically prohibits this kind of a referendum. Secondly, separatists’ moves were disjointed. Their parties did not agree on many key issues, the most important one being a dialogue with Spain. Even though the Catalan parliament proclaimed independence on the 27th of October, it was not a unanimous vote, many choosing to abstain or even vote against this precarious step. There is an animosity between the exiled Catalan president Carles Piugdemont and his deputy. This lack of agreement of course did not facilitate this extremely complicated and risky process. Thirdly, there is no plan for an independent Catalonia. Nationalists based their platform on populism and people’s resentment, but they did not offer any viable course of actions in case the region actually becomes a separate country. So many questions remain unanswered as to whether Catalonia is going to maintain open borders with the rest of Spain and the EU, or whether it is going to seek membership in the world’s major organizations like the NATO or the EU. Because of this uncertainty, many people who could potentially buttress independence, preferred to stay on the safe side. On the 21st of December the new elections for the Catalan government were held, which, to the ultimate dismay of the Spanish Prime Minister, resulted in three pro-independence parties defeating the temperate voice of reason and getting most seats. This, of course, sets a troubling scene for the future of the country’s unity. It is not hard to predict the future attempts of Catalonia to attain more autonomy or even independence. The Spanish Senate is, of course, expected to rule against it and clamp down on separatists. However, for how long will the crisis remain latent and to what extent will it unfold in the moment of truth? This is a more difficult question to answer. 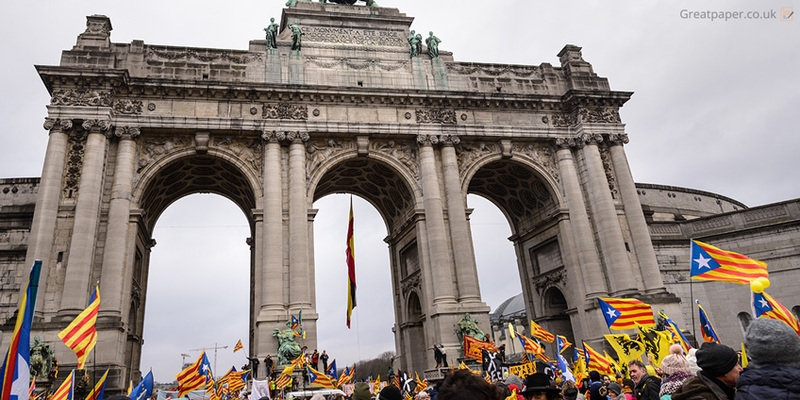 Seeing the nationalists getting the majority should send an alarming signal to Madrid. It is palpable that the people of Catalonia did not exactly like the dictator-like cleansing of the region, which simply wanted to regain its identity and be treated fairly in accordance with its contribution to the country’s economy. Even if the majority does not support the independence, seeing the central government dealing with the matter so brutally may alienate many Catalonians. When the catastrophe struck in the early days of October, the principal European countries including Germany and England spoke against the separatist movement. Naturally, they denounced the cruel actions of the Spanish government, but, in general, they seemed understanding and forgiving. However, not everybody shared the stance. For instance, the Scottish and the Flemish leaders expressed their sympathy towards the protestors as well as a hope that it would be a start of a new Europe. It is no secret and a strong nationalist sentiment has been circulating across many European countries for centuries. If Catalonia were to gain independence, it could set a dangerous international precedent which could inspire other aspiring countries to try their luck. This crisis clearly shows that Europe is no longer as united as it was in the aftermath of the Second World War. There are groups who would rather watch their own interests than work for the common good. It is difficult to determine a correct way of dealing with such people. Spain chose a path of aggressive oppression, but just two months later the same separatists were victorious in the newly elected Catalan government. It is a very sensitive matter to discuss, but this crisis proved the necessity to stop ignoring the divide and try to bridge it with dialogue rather than force.